Jetway have been producing budget motherboards for some time, and have recently expanded into the Small Form Factor (SFF) market with the MiniQ series of barebone systems. They currently supply 3 socket-370 models, each with slightly different specifications, and one high-end P4 model. 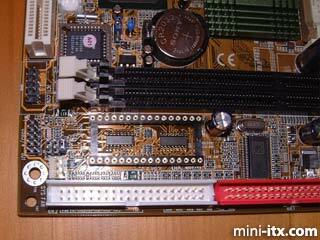 Recently, the motherboards used in the socket-370 versions have become available separately and we're going to take a look at one of those today - the B860T. 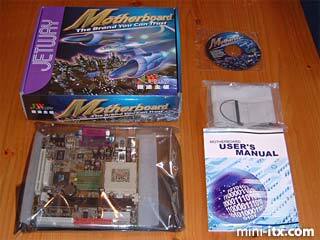 It can also be found as the Lex BN860T (interestingly, the review box was marked "BN860T", though the motherboard itself is marked "B860T"). The board can be viewed as a direct competitor to the VIA EPIA series of mini-ITX boards, so we shall compare the Jetway and VIA throughout the review. It's become common to find several "value-added" items in motherboard boxes recently, so it came as rather a surprise to see the back-to-basics content of the Jetway offering. However, once you take into account the price of the board (it can be found for about 2/3 the price of an EPIA 800), it starts to look pretty good value. One item missing from the package is a port mounting backplate. This is unfortunate as the ports are in a non-standard layout, and it's something that is included in the EPIA package. 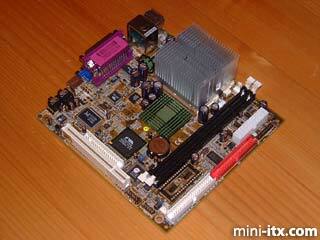 The board is of a format known as "Mini-Flex-ATX", which measures 170x180 mm, i.e. 10 mm deeper than the EPIA. It has the same mounting holes as the EPIA so is generally interchangeable, assuming sufficient clearance for the extra 10 mm of depth. It will fit into the Cubid 2677/2688 cases with no problems - the ATX power connector block is in exactly the same position as on the EPIA, so the Cubid's short power lead will reach too. The first obvious difference between the B860T and the EPIA is that the Jetway sports a standard ZIF socket to allow Socket 370 processors to be installed. It's compatible with both VIA C3 and the Intel P3 / Celeron range including the recent Tualatin-core chips. This gives the board a great flexibility, e.g. 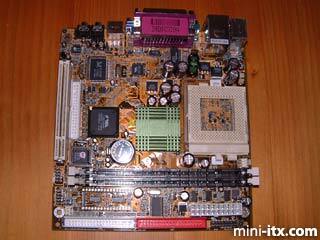 it could be used with a low-end C3 fitted with a passive heatsink to make a silent internet browsing box or webserver, or with a Tualatin Celeron 1400 to act as the basis for a small but powerful multimedia box. The downside of this is that the board isn't an all-in-one solution like the EPIA, though the total cost of an 800Mhz C3 CPU, heatsink and B860T is about the same as an EPIA 800. This is a Disk-On-Chip (DOC) DIP socket, which accepts flash chips up to 288MB. A DOC can be used in place of a hard drive, and is treated by the operating system as if it were a real hard drive. The manual is suitably vague about the whole thing, though plenty of information can be found with a bit of Googling. Finding suitable DOC chips (or should that be DO Chips?) is a harder task.